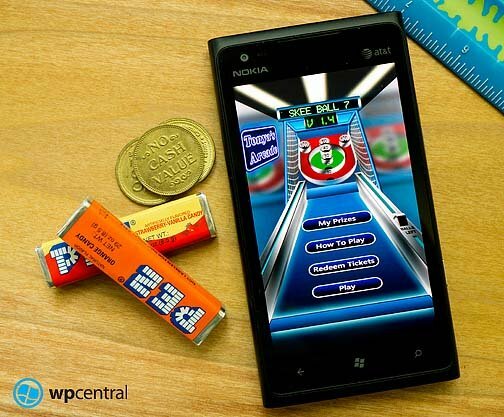 There's not much to the Windows Phone game Skee Ball 7. It's a skee ball game. You know the game, where you roll balls down a ramp to jump them into various slots for points. As you score points you earn tickets that can be turned in for prizes. We used to spend hours on end, spending big bucks to play skee ball and earn enough tickets to win a prize that likely cost far less than what we fed into the skee ball games. The arcade game has an addictive quality to it that kept you coming back to see how many points and tickets you could score. Skee Ball 7 represents the real life game fairly well and shares its addictive quality to a degree. You may not spend hours on end playing Skee Ball 7 but I found myself choosing Skee Ball 7 more times than not to help pass short bits of time with. Skee Ball 7 starts you out with eight balls that you have roll down the lane and jump into the various points slots. Score over 600 points and you get three bonus points and there are bonus balls thrown in for good measure. At the end of your game, you are rewarded tickets that can be spent on various trinkets. The ultimate goal is to win enough tickets to buy all the prizes. Oh... and the prizes aren't just nice images to look at. They are also interactive. Just tap on the "My Prizes" button from the main menu to tinker with your prizes. For example, tap on the rubber duck and it squeaks. Blow on the microphone and the whistle blows. All in all, Skee Ball 7 is a simple game with nice graphics and an addictive quality that keeps the game from getting old. The Marketplace description refers to the game as a fun timewaster and we won't disagree. 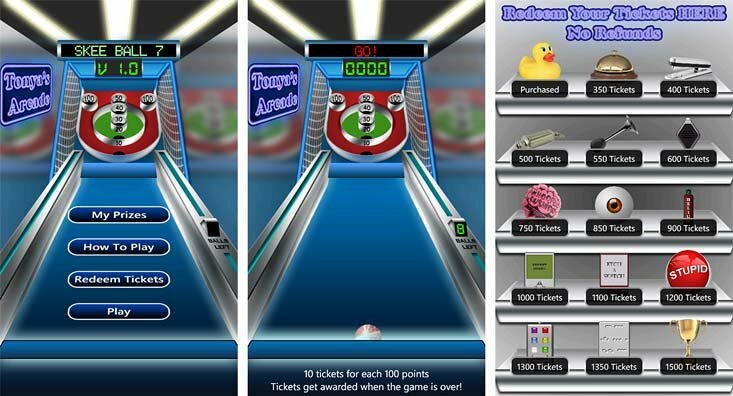 Skee Ball 7 is a free, ad supported game that you can grab here at the Windows Phone Marketplace.